This is a scalable context timeline. It contains events related to the event May 28, 1997: Defense Rests in McVeigh Trial; Unable to Shake Prosecution’s Case. You can narrow or broaden the context of this timeline by adjusting the zoom level. The lower the scale, the more relevant the items on average will be, while the higher the scale, the less relevant the items, on average, will be. 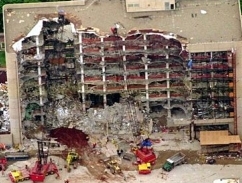 In the hours after the bombing of the Murrah Federal Building in Oklahoma City (see 8:35 a.m. - 9:02 a.m. April 19, 1995), some believe that the bombing was the work of Islamist terrorists. Televised news reports air theories of Islamist involvement, and say that eyewitnesses have reported seeing “Middle Eastern-looking men” fleeing the scene of the crime. [Los Angeles Times, 4/20/1995; Fox News, 4/13/2005] One eyewitness describes a man running from the scene clad in a black jogging outfit; many both in US intelligence and in the media assume that the man is likely Middle Eastern. One source tells reporters that the FBI has received claims of responsibility from at least eight groups, seven of which seem to be of Middle Eastern origin. Some officials privately fear that the bombing is the work of either Hamas or Islamic Jihad, two violently militant Islamist organizations. [Los Angeles Times, 4/20/1995; Serrano, 1998, pp. 185] Later in the day, Abdul Hakim Murad, an al-Qaeda operative in US custody, attempts to take credit for the bombing, but his associate Ramzi Yousef, also in US custody, does not (see April 19, 1995). In another instance, Jordanian-American Abraham Ahmad, attempting to fly to Jordan to visit relatives, is detained and questioned during a layover in Chicago. Ahmad, whom some sources describe as Palestinian-American, lives in Oklahoma City. A naturalized citizen who has lived in Oklahoma City since 1982, he has a background in computer science and is making a scheduled departure this morning to Jordan. His five suitcases contain, among other items, several car radios, large amounts of electrical wires, solder, a VCR, and a tool kit. He has packed a blue jogging suit and a pair of black sweatpants. Federal magistrates rush to serve him with a material warrant, moving so quickly that they misspell his name. He is stopped and questioned in Chicago before being allowed to continue his flight. He is stopped again in London, and this time is detained, strip-searched, and paraded in handcuffs through the crowded airport. He is photographed, fingerprinted, and returned to Washington before being transported to Oklahoma City. His name is leaked to the news media as a possible bombing suspect, creating a firestorm of interest; reporters crowd around his family’s home in Oklahoma City, and angry citizens vandalize his front yard. Authorities learn that Ahmad is going to Jordan for a family emergency. He will be released on April 21, will attend a memorial service for the bombing victims, and will file a $1.9 million lawsuit against the federal government. In later days, government officials such as counterterrorism “tsar” Richard Clarke will say that the possibility of Islamist involvement on some level is difficult to disprove (see Late 1992-Early 1993 and Late 1994 and November 5, 1994 - Early January 1995). [Serrano, 1998, pp. 185-186; Clarke, 2004, pp. 127; Fox News, 4/13/2005] Justice Department spokesman John Russell says of Ahmad: “He cooperated. There is no reason for him to be held.” (The Washington Post, in reporting this, does not name Ahmad, and identifies him as “Palestinian-American.”) [Washington Post, 4/22/1995] Shortly after the bombing, senior FBI profiler Clint Van Zandt, who had worked with the FBI at the Branch Davidian siege outside Waco, concludes that the bomber is probably a white male with militia ties and not an Islamist terrorist (see April 19, 1995). Michael Fortier, a friend of Oklahoma City bomber Timothy McVeigh who participated to an extent in the planning of the bombing (see March 24, 1988 - Late 1990, March 1993, May-September 1993, February - July 1994, August 1994, September 13, 1994, October 21 or 22, 1994, December 16, 1994 and After, 8:35 a.m. - 9:02 a.m. April 19, 1995, April 19, 1995 and After, After May 6, 1995, and May 19, 1995), testifies to a grand jury about his involvement in the bombing plot. Fortier’s wife Lori also testifies; her attorney, Mack Martin, says: “Her testimony had nothing to do with Mr. Fortier. Her testimony had to do with other people involved in the bombing.” She has been given given a grant of immunity in return for her testimony. Michael Fortier tells the jury of his visit to the Murrah Federal Building with McVeigh to reconnoiter the building, and admits that McVeigh told him he intended to bomb the building (see December 16, 1994 and After). He has pled guilty to illegal firearms trafficking, knowledge of the bombing, and lying to federal agents (see April 19, 1995 and After and April 23 - May 6, 1995). [New York Times, 8/7/1995; Washington Post, 8/9/1995; Washington Post, 8/11/1995; Mickolus and Simmons, 6/1997, pp. 811; Serrano, 1998, pp. 245; Douglas O. Linder, 2001; Fox News, 4/13/2005] McVeigh’s lawyer Stephen Jones says Michael Fortier is anything but a credible witness, and notes that Fortier has previously said in a television interview that he did not think McVeigh had any involvement in the bombing (see May 8, 1995). [Washington Post, 8/9/1995] Instead, Jones says in a court filing that the grand jury should begin looking for evidence of a “broad domestic or foreign conspiracy to bomb the Oklahoma City Federal building” by demanding intelligence reports on Iran and other avenues of investigation (see 10:00 a.m. April 19, 1995 and After). [New York Times, 8/9/1995] Fortier’s lawyer, Michael McGuire, will say his client came forward out of guilt and remorse. “There is no expression of grief or words sufficient to describe his anguish over the responsibility he feels for knowing about the plans to bomb the Murrah building,” McGuire will say. “The defining thing that made him want to cooperate was his conscience.” Jones says, “I think any time the government has to give two [potential] co-defendants a pretty good deal, there are weaknesses in the case.” Fortier faces a maximum of 23 years in prison and fines totaling $1 million. [Washington Post, 8/11/1995] Through his lawyers, Fortier cut a deal to testify if he was assured he would not be charged as a co-conspirator in the plot, though prosecutors refused to grant him full immunity. Some observers have speculated that Fortier may have agreed to cooperate if prosecutors granted his wife immunity [New York Times, 6/21/1995; New York Times, 8/7/1995] , a deal later confirmed by reporters. [New York Times, 8/8/1995] Lori Fortier tells grand jurors about witnessing McVeigh conduct a demonstration using soup cans on her kitchen floor that illustrated the effects of a massive bombing (see (February 1994)). McVeigh, she says, arranged soup cans to simulate the pattern he could make with barrels of explosives. McVeigh placed the soup cans in a triangle, she says, to direct the force of an explosion at a desired target, with two of the three points of the triangle flush against the side of the truck to maximize the damage. Michael Fortier did not witness the demonstration, she testifies. She also says that McVeigh once drew a diagram that showed how to blow up a building. [New York Times, 9/4/1995; Serrano, 1998, pp. 91] Both the Fortiers will repeat their testimony in McVeigh’s trial (see May 12-13, 1997). The defense in the trial of accused Oklahoma City bomber Timothy McVeigh (see 8:35 a.m. - 9:02 a.m. April 19, 1995 and August 10, 1995) rests after having presented 25 witnesses over less than four days of testimony. [Douglas O. Linder, 2001] McVeigh does not testify in his own defense. [Washington Post, 6/14/1997] Defense lawyers, led by Stephen Jones, found it difficult to cast doubt on the prosecution’s case (see May 21, 1997). Their story was that McVeigh was the unwitting victim of an overzealous federal investigation and the treachery of his friends. Today, they try to cast doubt on some of the witness testimony, with little apparent success, focusing on critical testimony by two friends of McVeigh’s, Michael and Lori Fortier (see May 19, 1995, August 8, 1995, April 29-30, 1997, After May 6, 1995, and May 12-13, 1997), calling them drug addicts who were lying in order to profit from their story and to avoid jail time. The last witness, Deborah Brown, who employed Lori Fortier at her tanning salon in Kingman, Arizona, testifies that she had bought amphetamines from the Fortiers, and tells the jury the Fortiers were so poor that “their baby was on some kind of state assistance to get formula and diapers.” Jones plays an audiotape for the jury of Michael Fortier’s telephone conversations that were wiretapped by federal agents in the weeks after the bombing, when Fortier was considered a suspect. In those recordings, Fortier boasted to his brother John that he could mislead federal agents and make a million dollars through book rights from his connection to McVeigh, saying: “I can tell a fable, I can tell stories all day long. The less I say now, the bigger the price will be later.” On another audiotape, Fortier, his voice slurred from apparent drug use, is heard telling a friend: “The less I say right now, the bigger the price later—there will be books, book rights. I’m the key, the head honcho, General Crank. I hold the key to it all.… I could pick my nose and wipe it on the judge’s desk.” Jones also plays excerpts from an interview Fortier gave CNN, where he said: “My friend Tim McVeigh is not the face of terror that is reported on the cover of Time magazine. I do not believe that Tim blew up any building in Oklahoma.” Fortier has already admitted that he lied to the press and the FBI during the early phases of the investigation. However, the defense has no alibi for McVeigh, nor does it offer an alternative theory to the prosecution’s version of events. The lawyers present their closing arguments in the trial of Timothy McVeigh, the accused Oklahoma City bomber (see 8:35 a.m. - 9:02 a.m. April 19, 1995).